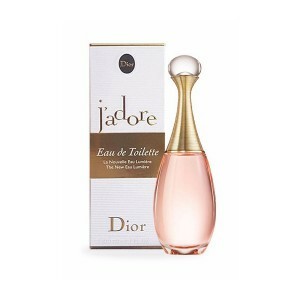 Christian Dior J'adore Eau Lumiere expresses fresh femininity & attracts attention. Christian Dior J'adore Eau Lumiere 100ml. Eau De Toilette expresses fresh femininity and attracts attention. This scent will enhance your joy of life and a good feeling. It evokes the merry moments of love and stimulates its own creativity. Women's fragrance Dior J'adore Eau Lumiere attracts attention with its citrus chords at the beginning that are pleasantly refreshing and recharging with new energy. Charming neroli, Damascus rose and magnolia in the floral heart of the scent make an incredibly seductive impression. Warm sandal and vanilla make the scent a very seductive atmosphere. The unique ladies fragrance Dior J'adore Eau Lumiere was launched in 2016. Discover your joyful essence with the unique Dior J'adore Eau Lumiere scent that shakes your heart. The amazing and unique fragrance of the J'adore Lumiere toilet water from the elite French brand Christian Dior gives the woman a soft glow and exquisite charm, emphasizes her nobility, elegance and unsurpassed style. This flower arrangement has an unusually inviting and seductive sound that even the most capricious admirers of elite perfumery will appreciate. Top notes open in a concise combination of invigorating citrus - juicy red orange and fresh lemon. The floral "heart" of the aroma whirls in dance with the lightest tender bouquet of damask rose, magnolia and neroli. In the elegant train came the languid sweetness of vanilla and the peaceful warmth of sandalwood.